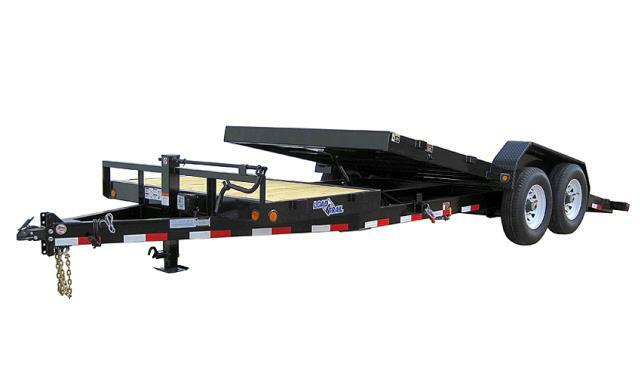 Our tilt deck trailer is a highly versatile in what it can haul. With dual axles, a 7'x18' tilting wood deck, and a 4' fixed wooden deck, it can haul most things 9,000lbs and under. OUTSIDE OF FENDER WIDTH 8FT 6"
TOTAL TRAILER LENGTH TONGUE TO TAIL 28FT 3"
* Please call us for any questions on our tilt deck trailer heavy equip. 12 000 rentals in Toledo OH and Perrysburg OH, serving the Toledo metro area.